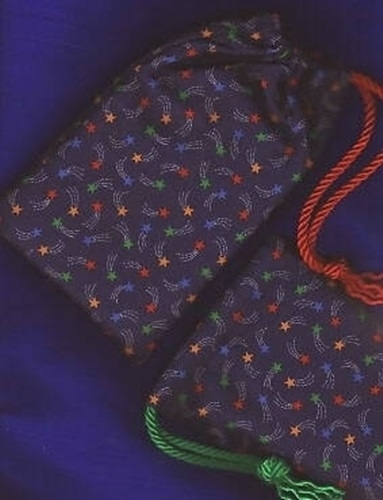 Regular Tarot Bags - Shooting Stars Single Draw Bag - Tarot Bags, Tarot Cards, Cloths, & More! Brightly colored card illustrations are an easy match for these shooting stars in red, yellow, green, and blue. Decks with dark or medium blue backs or borders will look especially attractive with this cloth. Pair it with the Golden Dawn Tarot, the plaid-backed Rider-Waite Tarot, the Universal Waite celestial backs, the Via Tarot, or decks that have primary colors in the illustrations. Size: Regular, approx. 4-3/4 x 7-3/4 inches. Fits standard size tarot decks.